At the start of every Grand Slam, some hapless player fails to win even a handful of games during their first-round match. The general public gets a gander at the loser’s paycheck, which at Wimbledon 2014 was 27,000 pounds (42,084 USD). The snide “nice work if you can get it” jokes practically write themselves. But, what are the likes of Petra Martic earning the rest of the year? As Paul Wachter, Archie Bland, Sean Davies, and others have pointed out, life in tennis’s minor leagues is not even remotely as lucrative as those cameos at the majors might suggest. 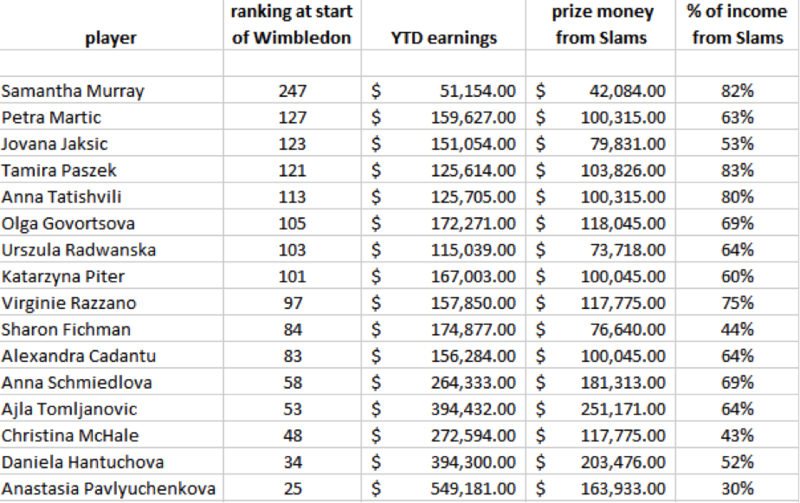 In the wake of this year’s Wimbledon — and L. Jon Wertheim’s musings about the widening gap between “run-of-the-mill tour events” and the Slam — I thought it might be interesting to study the income of Wimbledon’s first-round losers from a couple of different angles. I used the top quarter of the ladies’ singles draw as my sample. First, how much has each woman earned so far in 2014, and what percentage of that is from the Australian Open, Roland Garros, and Wimbledon? We are in the 28th week of 2014 — done with three of the Slams, but with five months left to go. Thus, the percentages should be reviewed with a grain of salt — with luck, each woman will earn between $224 and $120,000 at the remaining tournaments on her schedule (not counting Fed Cup, where the stipends vary among the participating countries and are not tracked by the WTA), which should lower the percentages you see in this chart. At the same time, the players whose Slam paychecks currently reflect 60% or more of their YTD earnings aren’t the ones you can bet on going deep in lesser tournaments, or even qualifying for the main draw of the higher-tier WTA events. A skim through Samantha Murray‘s results page at wtatennis.com shows her earning less than $1,000 at most tournaments; Anna Tatishvili’s checks generally fall between $1,000 and $2,000; Tamira Paszek, who continues to wrestle with injuries and ill health this year (this week, she couldn’t finish her match during the second round of Bucharest qualifying because of dizziness), collected less than $1,000 each time at five tournaments but more than $2,000 per tournament at six other events. Olga Govortsova’s earning pattern (or lack thereof) resembles Paszek’s, ranging from $530 in Estoril and $887 in Prague to $2,774 in Monterrey and $3,199 in Shenzhen. 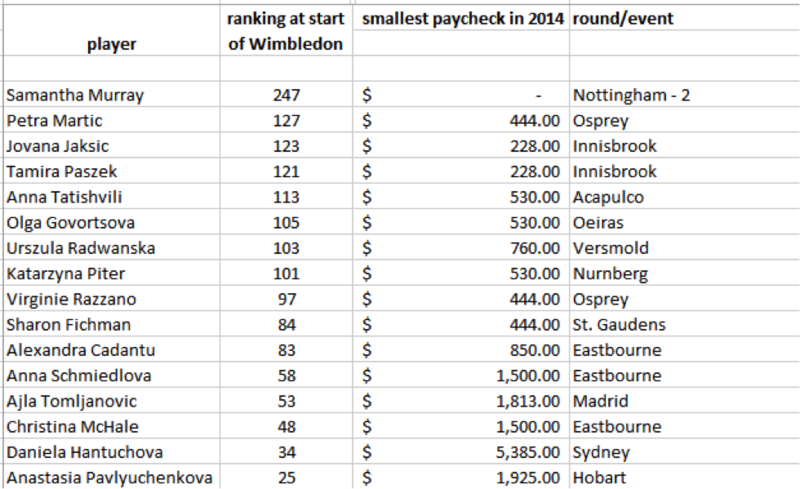 Here’s a look at our first-round losers from another angle: what was the smallest paycheck they’ve received this year? It’s worth keeping in mind that it’s neither logistically nor physically feasible for players to compete every week, and also to remember that win or lose, players must cover the cost of food, gear, lodging, transportation, taxes, entry fees, coaches’ stipends, and so on. Why do these numbers matter? To start, they may be affecting the quality of tennis during the first rounds of Slams. When the paycheck is twenty to forty times the size of one’s average winnings, odds are that players will show up at the office even when they’re not in fighting trim. Alisa Kleybanova lost to Lauren Davis 6-1 6-3 in the first round, with a heavily taped shoulder; she hadn’t competed in any tournaments since Roland Garros, and she’s had to drop out of World Team Tennis, which would have occupied the rest of this month. May 17 – second round of Nurnberg quals: injures wrist during win vs. Kristina Barrois. That’s nearly two months (and counting) sans income outside of the two appearances at Slams — and, at this rate, Martic won’t be making the main draws of much else in the near future (her ranking’s now down to 177). Perhaps she genuinely believed her wrist had healed enough for her to be competitive at Roland Garros and Wimbledon, but I can’t help seeing it through the lens of (relative) financial security: would the risk of aggravating an injury be worth $73,718? If you can resist that gamble, you have more faith in the future than I do, more sense, or a larger nest egg. The financial support a player receives — be it through earnings or grants or other programs — can also affect their decisions regarding nationality, as well as whether they can continue with a tennis career at all, and to what degree they can stand on principle when they disagree with their national tennis federation. I don’t have grand or brilliant ideas at hand for what needs to be done. As a fan whose piggy bank contains more echoes than Euros at present, I appreciate the lower ticket prices of qualifying rounds and non-Slam events, but I’m not blind to how this translates into less revenue (and, by extension, less prize money) for the players in those draws. I’m also all too aware that my interest in qualifying rounds and challengers is the exception rather than the rule (more than once, I’ve been asked if I was a player’s coach, either because I was the only person in the stands audibly cheering for them or because my compulsive scorecarding made me look official); if entertainment value ought to be the be-all and end-all of compensation (as some proponents of inequal prize money would have you believe), what is the point of funding anyone other than Federer, Nadal, the Williams sisters, and Sharapova? When I attended the Fed Cup playoff in St. Louis this past April, the other fans in my section were very vocal about how they felt the USTA had misled them into believing they would get to see Serena. Sloane, Madison, Caroline, Alize, and Virginie were all Top 100 players at that point, but that was not what those fans had traveled to St. Louis for, and they felt gypped. … and I, in turn, couldn’t help feeling like a fool when I found out the USTA was offering tickets at $10 to anyone who walked in that Sunday, in light of the $46 I’d forked over to Ticketmaster in advance. Again, I don’t have ready answers. But for changes to happen at all, there has to be more awareness of the overall structure of the tours — of how, for instance, that $42,084 paycheck in June is for many players essentially their compensation not for just a single match, but for all the sets they played in front of thin crowds, for the weeks they aren’t earning anything at all, and for their presence in the draw — without the Anna Tatishvilis, we likely wouldn’t get to see the Serena Williams in action during the round of 128. There has to be more help for the players (ranked 128 to 309) who will show up in, say, Carson next week; the champion will win $7,600 (with 30% of that deducted for taxes), but the first-round losers will net only $444, which may not cover even the plane or bus fare it cost to get to or from the tournament, let alone the rest of their expenses (including a $40 entry fee). But where is this help to come from? Some challengers are well supported by the communities hosting them (Winnetka and Midland come to mind), but there are other events (including some on the main circuit) where the attendance has been so anemic that I felt sorry for the sponsors. Might we one day conclude that the general public isn’t interested enough in professional tennis for anything more than exhibitions? That’s a doomsday scenario, of course, but I raise it to emphasize this question: how much money are we willing or able to invest in the next Kvitovas and Djokovics? If you’re feeling uncomfortable, please rest assured that you’re not alone. Excellent analysis Peg and thanks for bringing this to the attention of tennis fans everywhere. I recently saw where someone posted either on a message board on on Twitter about the pay cheques of the pros. I had to stop & remind said individual that despite the huge pay cheque, there are a whole other set of pros out there who are not even earning one/tenth of what that individual made. I think it had to do with Bouchard saying how hard life is as a tennis pro. People only see the top players with their entourages and huge pay cheques and prize money, but they really don’t see the person across from the top stars who get slaughtered and is barely making any money. Might this also be the reason why some players get involved in illegal gambling, as a way to maximise their income. The low pay also influences unscrupulous characters into the game. How many times have we heard of John Nobody on the WTA/ATP being banned for life because of bringing the game into disrepute. I am not making an excuse for people who break the rules, but it is really time for the ATP/WTA to take a stand on the issue of low wages for players at the Challenger/Futures level of the sport. Thanks, Karen — and, yes, I would not be surprised to find out that financial desperation (as opposed to sheer greed) was behind some of the cheating. Just want to point out that the Grantland piece wasn’t by Louisa Thomas. *facepalm* Thanks for catching that. Martic also got double bageled at AO. Therefore, she won only one game out of 30 in the Slams for 100K. Also, Hercog played only 6 points, I think, and got approx 27K at AO. It will be interesting to see if either of the player councils pursue prize money for injured players who withdraw in time for a LL to take their slot – something Isner, who’s now on the ATP board, says he’d like (with specific reference to the Hercog situation). A well-written article. I think the points in the article reflect a couple of different realities. 1) To the public at large, tennis is an 8-week a year sport, played at various 2-week intervals during the year. Concepts like the ATP Race and WTA Road to Wherever matter only to hard-core fans. The ATP Masters series and WTA 1000 events do a little better, but those get (in the US, anyway) much less attention from the mainstream sports media. 2) Tennis is promoted through the media in terms of a few star players and a few important tournaments. Those tournaments end players end up gaining much more than the other tournaments or players. At least some steps have been taken in the past few years to reward those who qualify but don’t make it very far into the draw of the slams. To me, a competitive, hard-fought match between players at any tournament can be as thrilling to watch as any final involving the greats. I wish there was some way to showcase the game as a whole. I remember watching qualifying rounds in Sydney at the beginning of the year (free entry for all which is great), and watched the likes of Stakhovsky, Struff and Vesely having to qualify through 3 rounds. The quality was just as good, just the names were not well-known. Stakho ended up with a winning streak all the way to the SF of the tournament so that was nice to see. Others that lost in early rounds of qualifying matches didn’t have as much luck..
I’m not quite sure whose fault it is, but both golf and tennis have allowed the media,(print, broadcast and online) to consign the non-slam tournaments, with a few exceptions to the dustbin of agate print. I subscribe to the LA Times, which used to be a great newspaper, and they rely on wire-service reporting for coverage of 95% of the tournaments in golf and tennis. In men’s golf they might cover, in addition to the majors, the Player’s Championship, and Arnold’s tournament (Bay Hill) and Jack’s tournament (the Memorial), but as for the non-major LPGA events, they will get at most two sentences in a round-up section. And it’s much the same with tennis. And it’s pretty much the same with regular news coverage. There will be 10 or 20 tv and cable trucks parked outside the Georgia courthouse where the sensational child-locked-in-the-car-to-die court proceedings are taking place — and none in the Georgia state capital where the NRA is backing “guns everywhere” legislation. Kim Kardashian and Lindsay Lohan get more press coverage than the Secretary of the Treasury or the head of the Federal Reserve. We do all know who the current Secretary of the Treasury and the Chairperson of the Federal Reserve are, don’t we? Whether we do or not, I’ll bet you dollars to donuts that most readers of this little rant can name the owner of the LA Clippers and his wife. Because the press covers scumbags like these two, rather than issues that actually matter to people. With all due respect to the nice sports journalists who at times contribute some great stories to this site and others, journalism, in many respects, has descended to Tweetalism. If a thought can’t be expressed in 140 characters, it’s apparently too complicated for the modern reading (I’m using the term loosely) audience. The dumbing down of America continues apace.